My boy Portifoy died of complications from lymphoma on June 26, 2012. I've been meaning to write about our experiences in the hopes that others could benefit. 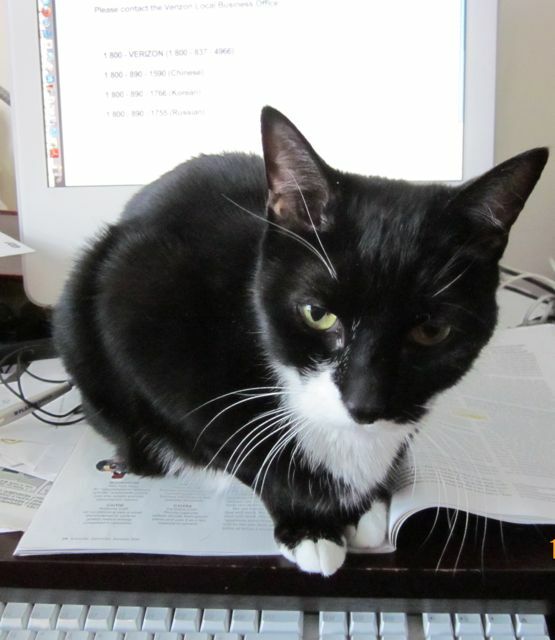 Portifoy, who was born around October 1996, was an intelligent, loving and active cat who learned to walk on a lead--and of course, he got into all sorts of trouble. Over the years, I had to take him to the emergency room because he cut his foot plowing through a Venetian blind or nibbled on a plant he shouldn't have. The first signs of intestinal trouble began in late winter of 2011, when he started losing his appetite. He was always a finicky eater, running away from his bowl that simply invited his two brothers to polish off his remainder. But he began throwing up more, eating less and losing weight from his typical 10 pounds. On examination at the Forest Hills Cat Hospital, Dr. Tuzio palpated his abdomen and found a hard mass at his intestine. Fearing cancer, she ordered an ultrasound and biopsy. Fortunately, the biopsy came back negative, and the ultrasound revealed that his organs were fine--no invasive cancer. So the diagnosis was irritable bowel syndrome, and Portifoy began a daily therapy of prednisone, a steroid. He soon regained his weight and vigor, and I weaned him off the prednisone without any problems. He was his old self, jumping on my desk while I worked, doing his patrol around the house on a lead, batting his paw at my side to get me to sit on the sofa so he could curl up under my arm while we watched TV. But early spring 2012 saw the symptoms return--weight loss, vomiting, no appetite. I thought his IBS had returned, so off the vet we went. But he also had signs of a kidney infection, a common occurrence for elderly male neutered cats, I was told. Because prednisone dampens the immune system, which he needed to fight the infection, we couldn't start pred therapy until a month later, when his kidney infection cleared with antibiotics. During that time, Portifoy uncharacteristically began hiding under the upstairs bedroom and refused to eat much. Clearly, he wasn't feeling well. The follow-up visit on May 3 turned out to be the turning point. He had lost too much weight (his weight dropped to about 8 pounds), and Dr. Tuzio concluded his best bet for survival was a feeding tube inserted through his neck and into his esophagus. An ultrasound revealed bad news--it was likely to be some sort of cancer. A blood test revealed that his liver was barely functioning. Dr. Nebel, one of the other vets at the office, was not optimistic about elderly cats with such a cancer, telling me that treatment would prolong his life by a couple of months on average. Dr. Tuzio, on the other hand, said that if it's small-cell lymphoma, a common cancer among cats, then it could be treated with chemotherapy, and cats have been known to live a couple of years. But the only way to diagnose small-cell lymphoma was to conduct an ultrasonically guided biopsy. Since time was of the essence, we scheduled a visit to the Atlantic Coast Veterinary Specialists, an hour's drive from us. In the meantime, we began feeding Portifoy through his tube. Using a blender, we pureed Royal Canin recovery formula and injected 50 ml of food four times a day. I also began to notice Portifoy would occasionally stumble with his back legs; evidently, the mass began pressing on his spine and affected his coordination. He also strained to use the litter box, a sign that his core muscles were weakening--both from his age and from his disease, most likely. The biopsy went well--at first. The vets were able to extract a sample, and on examination, they discovered that Portifoy also had fluid in his chest that restricted his breathing, so they drained that. This fluid was likely the result of another mass in his lymph system at his chest that began leaking fluid (later, we would discover that it leaked continually, requiring chest taps every few days). That afternoon on May 9, we picked up Portifoy, who was staggering in his cage as he recovered from the general anesthesia. At least, that's what we thought. It turned out that the stress of the procedure made the mass press even harder on his spine, and he was dizzy from that. The hospital should never have released him to us in that condition. On the drive back home, we could hear Portifoy banging around in his carrier as he tried to stand. When we got home, he just staggered to and fro. He at least had an appetite and went to his food bowl, but ultimate he did not eat much. We still thought it was the anesthesia wearing off. To protect him, I set up a lot of towels and pillows around, a water bowl and his own litter box upstairs in the spare bedroom, and slept with him, helping him to the litter box when he needed to. The next day, his symptoms had not improved, and we took him to our vet, who showed us how his eyes were swimming in his head! He needed to go on seasickness medicine--Bonin. A Pre-emptive Risk that helped a lot, but we had to wait 5 working days to get the results back from the pathologist. Considering how downhill Portifoy was going, this seemed like an interminable and unacceptable wait. I asked about preemptively starting Portifoy on chemo, but the vet specialists said it wouldn't be a good idea since the wrong medicine could make things worse. But there was only one therapy I would tolerate for Portifoy: oral chemotherapy, in the form of a pill taken once every 3-4 days. Called leukeran, it works well for small-cell lymphoma, the kind that is most successfully treated. I wouldn't want him on a chemo drip that makes him sick and nauseated. On Friday, we still had not gotten the results in, and because there was only one therapy I would allow, I convinced my vet, Dr. Luger, to start him on Leukeran before we got the results. Time is of the essence in a fast-moving cancer. It turned out to be a good gamble: the pathologist confirmed it was small-cell lymphoma on Tuesday, May 16. Thus began the slow, long accumulation of medicine: Zofran (nausea), Marin, Actigal (both for liver), prednisone, tumil-K (to boost his lowered potassium level), lasix (for the fluid edema) and Leukeran, the anti-cancer chemo drug taken once every four days. And on some occasion, antibiotics Baytril and Flagyl. And a ½ teaspoon of Miralax twice daily to help his bowel movements: before, he would strain, which would make him vomit. Not a good thing when you're trying to get him to gain weight. I never thought I would allow it to get this far in terms of medicine. It's a slippery slope: just one more med to treat one symptom, and then another to treat a new symptom. Thankfully, since I was feeding him through a tube, I could crush his meds in a pestle and mortar and mix it in with his mash. Fortunately, he no longer was dizzy and no longer needed Bonin, but he still showed a bit of ataxia in this back legs. Feeding Tube Issues: For the next few weeks, we established a routine. Feeding could be time consuming: you push in 5 ml at a time and wait about a minute. So prep work and feeding and tube-flushing could take up to half an hour at a time. Since Portifoy needed to eat a can of food per day, spread out 4 times a day, we had to refrigerate the food after the first blending. Rather than using the old hot water trick, we just microwaved it and stirred, making sure it was room temperature. (I got used to sticking my finger into his food all the time.) A not uncommon problem with feeding tubes is that the tube can become clogged. This happened to us, and it's quite scary. All of a sudden you feel a lot of pressure on the syringe, and some food and medicine squirted back out the side. I tried the Coca-cola trick--as did one of the techs at the vet's office--which seemed to help at first but really didn't. So here's a trick that worked: get some wire that can fit through the feeding tube. We got ours from Michael's, 18-gauge aluminum wire. Measure from the entry point of the feeding tube, around to the point where it enters your cat's throat. Mark off this distance on the aluminum wire; to be safe, mark off less than what you measure. Slowly thread the wire into the tube, being careful to not go past the mark. I had to push and pull a bit, then finally I could hear the gurgle indicating that the tube had cleared. From then on, we were always careful to flush the tube with a bit more fluid. An even more common problem: the syringe becomes harder to plunge as it gets older. I did a little research, and it turns out that manufacturers coat the rubber with silicon oil. I happened to have some for the rubber O-ring of an aquarium filter I have (being aquarium grade, I figured it's good enough to use--you can get this oil from any aquarium pet store). I put some on my fingertip and smeared the outside of the rubber on the plunger, giving it a thin coat. It worked great, providing a much smoother plunge than some other solutions I've read about on the Internet, like Vaseline or vegetable oil. In weighing Portifoy every few days, I was happy to see him gaining weight. Unfortunately, it turned out to be water weight that came from his leaking chest mass. Periodically, an edema would form that made it hard for him to breathe. It's hard to tell how discomforting this is to a cat, but Dr. Luger likened it to something asthma patients feel when they get short of breath. So in for a chest tap we would go, at $50 an attempt, plus a bandage change for his feeding tube. The next few weeks were hopeful--I had already gone through a roller-coaster of emotion, at first hearing that he had cancer and I would have to put him to sleep, to the hope of treatment, to seeing him stagger around in ways that could not possibly be good for him, to slow improvement. He still hid under the bed often, but he knew when it was feeding time, and when I returned upstairs with a syringe of food, I would often find him sitting on the bed, ready for a feeding. Blood tests were showing improved liver function and his heart was strong, even if he kept developing fluid in his chest. His urine was dark from the excessive bilirubin spilling out of his liver, but it didn't seem to get any worse. Decision Time: Then, on June 22, when we went in for a routine bandage change. Dr. Luger said his liver was improving, so let's keep the regimen going. But, when he got back from the back room, we got the bad news--his skin starting dying at the point where the tape held his bandage in place. Such necrotizing of the skin apparently doesn't go away--it just gets worse over time. So I finally made the decision that was the hardest in my life--all the more so because so many of his symptoms were showing improvement. You hope that maybe if he can hold on another day, he'll get over the hump and recover. Everyone told me that your cat or dog will tell you when it's time, but I'm not sure I ever got such a clear signal from Portifoy. We had once last chest tap to make him feel better, and asked Dr. Nebel to come to our house Tuesday afternoon. I took the day off work and spent it with Portifoy. He was too weak to walk much, so I carried him around outside the house for one last patrol. A little catnip. A last feeding. A final cuddle under my arm on the sofa. I wasn't exactly sure what to expect. Certainly, on the first injection to knock him out, he let out a yowl letting us know he felt the needle. Then he involuntarily threw up (he seemed to be passed out at the time). The final injection went into the heart. I'm not sure if there's a more painless, dignified end--I just thought it'd be one massive pentobarbital injection through a vein, not into the heart. Anyway, I recommend that the kids not be present for the end like this--the memory of his last moments are still seared in my mind, when I'd much rather remember Portifoy as the healthy, affectionate cat. If you're going through something similar with your animal companion, I wish you the best of luck. I set my screen saver to show pictures of my cats, and when Portifoy's show up, I realize how much I miss him--and that no matter how painful the final decision was, his life enriched mine in ways that I couldn't have imagined.